Ahead of the announcement of Assembly elections in Himachal Pradesh, the BJP finalised its first list of 45 candidates late tonight with Chief Minister Prem Kumar Dhumal to contest from Hamirpur. His former seat Bamsan was lost in delimitation. Accusing the BJP of betraying the electorate by not fulfilling the poll promises made in 2007, state Congress president Virbhadra Singh said today that the achievements being flashed through advertisement campaigns in the media were on account of the “Centrally sponsored” schemes and were “not a part” of their election manifesto. Tension gripped the Convent of Jesus and Mary today as parents of the two students who died under mysterious circumstances stormed into the school premises and criticised the school management and staff, virtually laying siege to the school for almost three hours. State government pensioners aged between 65 and 80 years will be given 5 per cent of the basic pension as allowance. Though much was expected, nothing special came out of the four-day special general meeting of Tibetans that concluded here today. Decks have been cleared for the extension of the Mid-Himalayan Watershed Development Project to 102 more villages with the Governing Body of the World Bank approving $ 37 million for the implementation of the second phase of the project. Chief Secretary S Roy yesterday appealed to bankers to launch an intensive campaign for 100 per cent coverage of households with bank accounts in both rural and urban areas to achieve the objective of financial inclusion. He was speaking during the inauguration of the 125th state-level Bankers Committee meeting here. With the CPM leaders demanding takeover of Shanidev temple, Lamblu, the alleged irregularities by Sewa Bharti, the committee managing the affairs of temple, has again come to fore. 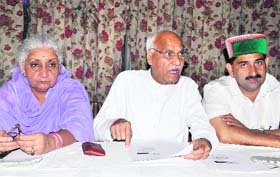 Congress leaders from Kangra, Chander Kumar, former MP and senior vice-president of the HPCC, Chandresh Kumari, MP, Jodhpur, and Kewal Singh Pathania held a joint press conference here yesterday and hailed the step taken by the UPA Government in implementing the one-rank-one-pension scheme. Himachal Lokhit Party (HLP) leaders Maheshwar Singh, Shyama Sharma, Mohinder Sofat, KD Dharmani, Naveen Dhiman, BR Mandyal, Tikku Thakur, Dulo Ram and Harish Chander Sharma today accused Chief Minister PK Dhumal and former Congress president Kaul Singh Thakur of a tacit understanding on the issue of corruption. The state road transport corporation has installed global positioning system (GPS)-based vehicle tracking system in all the mini cabs being operated by it in the state capital in partnership with private operators to ensure effective monitoring. The State Public Service Commission has postponed the interviews of the candidates who qualified the Himachal Pradesh Judicial Service (Main) Written Examination -2012 scheduled for October 11 and 12. No big buses, including Volvo, can enter the new bus station in this town inaugurated by Chief Minister PK Dhumal on September 13. Lyon, Roseline and their group from France had a pleasant surprise yesterday at 7.30am when their train, Shivalik Express, was halted for eight minutes at Barog where officials of the Tourism Department along with local volunteers welcomed them in a traditional way. 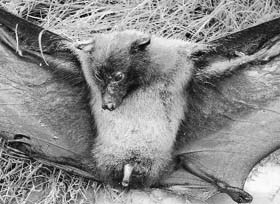 Bats in thousands have invaded the apple belt, damaging the crop under the cover of darkness as they not only feed on fruit, but mate in trees then and fight, wreaking havoc in orchards and giving sleepless nights to farmers. Ajit Singh was unanimously chosen president of the Jogindra Central Co-operative Bank Employee Union for the 11th time at a general house held at Kunihar recently. The party re-nominated at least eight ministers for the elections, with Forest Minister Khimi Ram to contest from Banjar assembly constituency in Kullu district, Education Minister Ishwar Dass Dhiman from Bhoraj in Hamirpur and Social Welfare Minister Sarveen Chaudhary from Shahpur in Kangra district. Dhiman has shifted his seat from Mewa to Bhoraj after delimitation. Revenue Minister Thakur Gulab Singh, who is related to Dhumal, will contest from Joginder Nagar assembly constituency in Mandi, while Industries Minister Kishan Kapoor will contest from Dharamsala and Health Minister Narinder Bragta from Jubbal Kotkhai in Shimla. Panchayati Raj and Rural Development Minister Jairam Thakur will contest from Siraj assembly seat and Transport minister Thakur Mahender Singh from Dharampur in Mandi. State BJP President Satpal Satti will contest from Una constituency, while former Health Minister Rajiv Bindal has been shifted from Solan to Nahan. Bindal was ousted a few months ago following corruption charges, after he was targeted by the opposition for allegedly amassing disproportionate assets. Urmil Thakur, who used to contest from Hamirpur has vacated her seat for Dhumal and will contest from Sujanpur in the CM's home district. In Hamirpur district, Baldev Sharma will contest from Badsar seat; Vijay Agnihotri from Nadaun. Churah: Hansraj; Chamba: BK Chouhan; Dalhousie: Renu chaddha; Bhatiyat: Vikram Jarial. Theog: Rakesh Varma; Kusumpati: Prem Singh Thakur; Shimla: Suresh Bhardwaj; Jubbal-Kotkhai: Narendra Bragata; Rampur (S.C): Prem Singh Drek. Taking on Chief Minister PK Dhumal on the issue, he said it was being repeatedly claimed that the government had done much more than the party promised in its manifesto of 2007, but the fact was that it “did not promise” much. He alleged that the Dhumal government failed to implement whatever promises were made, adding that the manifesto was only a ritual, a formality to be observed before elections. A Jalandhar-based Chief Minister was more interested in implementing a five-year development plan for himself and his family rather than wasting time in implementing promises made to the people of the state, he alleged. The 2012 manifesto would be no different. In fact, veteran leader Shanta Kumar in 2003 called Dhumal “incompetent” and accused him of not keeping the promises made to the people in 1998. It has been the “same story” this time, he said. Dhumal’s claim that he was “sarkon walla Mukhya Mantri” was “laughable” considering that all he did during his five years was to build 3,038 km of roads, while the Congress government had built 27,000 km of roads starting from 218 km of roads in 1948. In fact under the Dhumal regime, funds for road construction and maintenance were “diverted” and roads were built “without technical sanction”, he said. The BJP government did not make any road policy despite the fact that the CAG had underlined its need, he alleged. “The BJP manifesto promised to pay a special attention to the Centrally sponsored schemes and that a special cell will be created for the purpose, but it surrendered funds under these schemes,” he said. “In education it did not utilise Rs 301 crore over the past three years and the state slipped in the National Education Development Index with its ranking coming down to 17th position in 2009-10 from 3rd in 2006-07,” Virbhadra said. The government failed miserably on the employment front as evident from the fact that during the past four years, nearly 1,500 government jobs had been abolished and over 44,000 posts were lying vacant in various government departments, he alleged. The families, relatives and friends of the girls, Nancy Thakur and Sakshi Thakur, forced their way into the school raising slogans and demanding the registration of a case against the teacher who had allegedly punished them on the day of the mishap. Many students of the school joined them by raising slogans against the teachers and the school management for causing mental torture to students by subjecting them to both physical and mental torture. The situation turned chaotic when the parents of all students rushed to the school on getting an SMS alert around 11:30 am that they should immediately come and take back children from school. With many parents objecting to the chaos in the school, along with slogan-shouting by relatives of the deceased, the situation became tense, with the two groups almost coming to blows. The police hardly made any effort to defuse the situation. 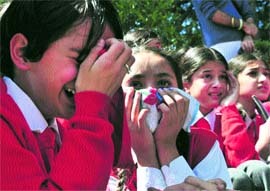 Seeing the tension and slogan-shouting in the school, many children were seen crying and looking for their parents desperately. The families of the deceased also rebuked some teachers who tried to reason with them that they should not disrupt the functioning of the school. “Right from Day One, the school management has been shielding the teacher responsible for pushing the two girls to death and the police has not registered an FIR or made any arrests,” said Sakshi’s father Kailash Thakur, a teacher with a government school. Demanding a high-level probe into the incident, he took strong exception to the adverse and unpleasant remarks being made by teachers against the two girls who were good in studies. He asked why the parents were not informed if teachers had so many complaints against the girls. “An attempt is being made by the school management and staff to save class teachers by accusing the girls of acts which they never indulged in,” alleged Thakur. Nancy’s paternal uncle alleged that the girls had virtually been pushed to death and the families would be forced to move court if investigations remained tardy. He said the school management and staff were present in hospital immediately after the mishap while the families were informed at 6:30 pm. Superintendent of Police Chandershekhar Sharma said investigations into the case were on and if the families were not satisfied, they could demand probe by the CID, to which he had no objection. In the evening, the district administration and the police held a meeting with the school management in the presence of the parents of some students to defuse the crisis. The parents of the deceased gave a request in writing, seeking the registration of an FIR. Those who attended the meeting included Deputy Commissioner Arun Sharma, Chandershekhar Sharma, the school principal and some staff members and parents. A complaint signed by 45 teachers was handed over to the police, seeking action against those who had created a ruckus on the school premises by taking the law into their hands. They named a person who misbehaved with and manhandled members of staff. Deputy Superintendent of Police Parveer Thakur, investigating the case, said legal opinion was being sought about the registration of an FIR. He said the matter was being investigated under Section 174 (inquest proceedings) and could be converted into an FIR if required. An official spokesperson said here today that instructions in this regard had been issued and the allowance would be admissible from October 1. He said pensioners who have attained the age of 80 years and above had already been given additional pension on their basic pension. Pension allowance would be admissible on attaining the age of 65 years and above but less than 80 years from the 1st day of the month in which the date of birth of a pensioner falls. This allowance will also be admissible to the All-India Service Pensioners of Himachal Pradesh Cadre and the HP Government Family Pensioners. As per Lobsang Sangay, Leader of Tibetan People (new designation of the Tibetan Prime Minister-in-exile), who addressed mediapersons after the meeting, 31 recommendations were made during the meeting. The Central Tibetan Administration (CTA) would adopt the resolutions, he said. While some of recommendations would be adopted immediately, other would be adopted in the coming months or years as per suitability, he said. Sangay further said a suggestion was made during the meeting that envoys of the Dalai Lama be appointed immediately so that dialogue with China could be carried out. Both envoys of the Dalai Lama had resigned and the CTA had not appointed new envoys. Sangay said the CTA would expedite work on appointing the envoys for holding talks with China. On queries regarding steps to check self-immolations by Tibetans, Sangay said they expressed solidarity with monks committing self-immolations in Tibet. The meeting was convened especially to discuss the situation arising from cases of over 51 Tibetans committing self-immolation in Tibet. About 400 representatives of the Tibetan community from across the world attended the meeting to deliberate on forming a new policy to tackle the situation arising from the self-immolations. Sangay also clarified that the issues of the middle approach advocated by the Dalai Lama or seeking freedom for Tibet did not come up for discussion during the meeting. Sources here said the recommendations that came up during the meeting mostly pertained to lobbying with the international community to exert pressure on China to change its approach to Tibet. Talking to The Tribune, the Tibetan Youth Congress, the hardline faction of Tibetan exiles, expressed dissatisfaction at the results of the meeting. The activists said they were not satisfied as many contentious issued were not discussed. They were of the view that the leadership of Tibetan exiles was properly dealing with the situation arising due to the self-immolations in Tibet. Sources here said many participants in the meeting critically stressed that the Tibetan community should not plan to stay on in exile and should make every effort to return to Tibet. This was the most prominent message sent by Tibetans in Tibet for the ongoing special meeting to the exiled seat in Dharamsala, they said. 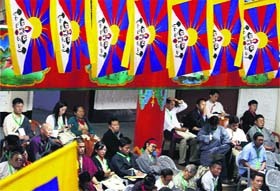 Suggestions and remarks from over 360 Tibetans from around Tibet’s capital Lhasa and areas of Kham reached the meeting. Messages from Tibet were broadly categorised into seven remarks and were discreetly collected over telephone by Ven Ngawang Woebar, a former political prisoner, and Ven Thubten Yangphel, a monk living in Dharamsala. In all, the project will be implemented in 704 villages in the second phase from April 2013 to April 2016. The cost of the first phase of project was Rs 337 ($60 million). The additional amount will also be utilised for consolidation of the first phase to ensure sustainability, besides covering 102 new villages. The approval was granted at a meeting of the bank held at Washington yesterday. An appraisal mission of the bank, headed by senior natural resources management specialist Ranjan Samantaray, had visited the state in May to evaluate the proposal for the extension of the project. The additional funding will help consolidate some of the gains made in the original Project and extend it to 102 contiguous panchayats that falls within the same micro-catchment area where the project is operational. It will also take care of cost overruns due to price escalation. Such additional watershed treatment for panchayats that fall in the same river basins is expected to maximise the impact and ensure longterm hydrological sustainability of the region. At present, the project is being implemented in 272 micro watersheds spread over 602 panchayats, 42 blocks and 10 districts of the state. The areas falling between the altitudinal limit of 600 m and 1800 m are being covered. The term of the project that was launched in 2006 will be effectively extended by three years and it will be now expanded to 10 years. So far, around 6,151 water harvesting tanks, 1,093 ponds/tanks, 287 dams, 263 lift/gravity irrigation schemes, 43 small underground tanks used for irrigation, also known as ‘makowal’ structures, and 203 km of irrigation channels have been developed under the project. The benefits from these structures have reached some 1,00000 families. It has converted about 9,000 hectares of rain-fed areas into irrigated land through watershed management techniques. At the mid-term review (November 9-18, 2009), there was an increase in yields of paddy (236 per cent), maize (163 per cent), and wheat (90 per cent), which has surpassed the end-of-project target of 50 per cent. The increase in milk yield was 11 per cent. Chief Secretary S Roy yesterday appealed to bankers to launch an intensive campaign for 100 per cent coverage of households with bank accounts in both rural and urban areas to achieve the objective of financial inclusion. He was speaking during the inauguration of the 125th state-level Bankers Committee meeting here. “Complete coverage of all households will give a sound platform for the adoption of many schemes of the Centre and the state government for direct transfer of benefits to bank accounts of beneficiaries,” he said. The Chief Secretary said banks had disbursed fresh credit to the tune of Rs 2,213 crore during the first quarter of the current financial year under various schemes, benefiting 1.31 lakh beneficiaries. These allegations were also levelled by the Suheri Gram Sudhar Sabha earlier and it had demanded action in the arbitrary functioning of the Sewa Bharti and financial irregularities after meeting the Deputy Commissioner, Hamiprur. Chander Kumar said as an MP, he had been lobbying for the one-rank-one-pension scheme. The three leaders also justified the decision of the UPA government in allowing the Foreign Direct Investment (FDI) in retail sector. Chandresh Kumari said the BJP should make it clear weather the party was in favour of farmers or middlemen. The FDI would help in increasing the income of the farmers. It would only reduce the margins of the middlemen, who were exploiting farmers, she said. Pathania criticised the state government for “not providing” land to bring up a Central university in the state. “While the Central universities in other states have their own campus, in Himachal, the state government has failed to provide suitable land for the project,” he said. However, their coming together for a press conference at Dharamsala has fuelled speculations. Some political observers said it might indicate towards the formation of another political group within the Congress from Kangra district. Chander Kumar is not likely to contest from the Jawali constituency in the forthcoming Assembly poll as at present his son, Neeraj Bharti, represents it. Sources here indicated that he might be interested in contesting from Dharamsala in case he emerged as consensus candidate owing to the presence of a large numbers of OBCs in the constituency after the delimitation process. However, for this he would have to seek the favour of Chandresh Kumari, who is also a former MLA from Dharamsala. Chander Kumar, however, denied that he was in favour of contesting elections from Dharamsala. Chandresh Kumari has sought Congress ticket from Dharamsala for her son, Ashwarya Katoch. The sources said HPCC chief Virbhadra Singh has proposed the name of Sudhir Sharma, Congress MLA from Baijnath. Pathania, who is seeking a party ticket from Shahpur, is facing trouble due to the criteria of the party of not giving ticket to those candidates who had lost by a margin of more than 10,000 votes in the last Assembly elections. However, the fact that not many Congressmen are keen to contest from Shahpur might work in his favour. Pathania denied that the coming together of the three leaders was an emergence of a new group in the Kangra Congress. He said it was a coincidence that the three leaders came together. “I and Chander Kumar had already planned a press conference. Since Chandresh Kumari was in Dharamsala, she also joined us,” he added. They asserted that the people would come out openly against the Bharatiya Janata Party (BJP) and the Congress by electing a third front. Though the HLP got a mild public response to its rally as many stands were empty, HLP president Maheshwar Singh claimed that people were terrorised by the Dhumal government. He accused the BJP government of misusing the name of former Prime Minister Atal Bihari Vajpayee to hide its sins. He said the HLP had observed Bhagat Singh’s martyrdom anniversary as its foundation day and the Himachal Lok Morcha would play a leading role in the Assembly elections. Maheshwar Singh was not affected by the low turnout and instead, focused his speech on attacking the BJP and the Congress, terming them the two sides of the same coin. He alleged that Dhumal had not fulfilled the promises to the people like solutions to the monkey, wildlife and stray cattle menace and compensation for farmers. He said the government could neither maintain roads properly, nor appoint doctors and teachers, and instead, encouraged the land mafias. Dhumal was inaugurating incomplete projects and his ministers laying foundation stones of projects for which there were no budget provisions, he added. Maheshwar Singh said the HLP would release its manifesto soon, in which the top priority would be given to the welfare of the common man. “We will make schemes at the village level and not impose them from above,” he added. Shyama Sharma claimed that the BJP had become a party of liars and Shanta Kumar was isolated. She alleged that BJP leaders had become property dealers. The HLP was the first party to release its vision document, she asserted. HLP vice-president KD Dharmani alleged that BJP leaders Dhumal and JP Nadda were promoting members of their families by giving them important posts. BR Mandyal, Naveen Dhiman and Mohinder Sofat alleged that the Dhumal government was the most corrupt and party president Nitin Gadkari removed Khimi Ram as state party president and Rajeev Bindal as Health Minister on charges of corruption, but they were rewarded later. The high-tech system will provide real-time information about the movement of these vehicles to enable the authorities to ascertain if cabs were plying in time and adhering to the prescribed speed limits, particularly, on the sealed and restricted roads. Devices have been installed on all vehicles being operated on 21 old routes and the two newly introduced routes to connect the new court complex in Chakkar with the high court and the DC Office complex. The device will send information to a central server and the record will be stored up to 90 days that will enable the corporation to take action in respect of complaints pertaining to over-speeding and non-plying of cabs or erratic service. The total cost of Rs 1.25 lakh will be shared equally by the corporation and respective operators. The corporation will get revenue of about Rs 75 lakh from the 23 routes allotted to private operators by inviting tenders. The system has been put in place on the orders of the high court that intervened in the matter in view of complaints of over-speeding on sealed and restricted roads, which are otherwise the preserve of pedestrians. There have been similar complaints against the local bus services over not plying as per the time table, particularly the four buses specially deployed to connect the old and the new bus stand. As a result of which commuters face issues especially during the odd evening and morning hours. The corporation is now planning to install the system on these vehicles to ensure effective monitoring. In the next phase, the central server will be linked to the web portal so that the general public could get information regarding the local cab service through Internet. There have been more complaints against private bus operators, who have not been plying buses in accordance with the time table. Secretary of the commission Trilok Singh Chauhan said the interviews scheduled for two days would now be held on October 13 in one day. There had been no other change in other terms and conditions, he added. The hurriedly constructed Rs 16-crore bus stand, expedited by Transport Minister Mohinder Singh Thakur, has exposed its “defect in design” as no big buses can enter the bus stand. The corridor and corners of the bus stand were being used as open toilets by passengers as toilets were locked due to lack of water, making the bus station unhygienic, resented passengers. The IPH Department was yet to supply water to the bus station. The bus stand can accommodate only 18 buses at a time. As many as 13 bus bays have become operational and five bays are still under construction. The incomplete bus station is facing issues due to lack of space. “There are traffic jams at times and we have to park buses outside the bus station,” drivers said. The in charge of the bus station expressed helplessness by saying that they do not have sanitary staff and toilets were locked due to lack of water supply. However, the Transport Minister expressed ignorance over the matter. The tourism official and other volunteers later apprised them about the importance of the World Tourism Day being celebrated yesterday. From Tiuni in the Pabbar valley, bordering Uttarakhand, to Bajaura, Naggar and Manali, the bat menace has been spreading under the nose of the Wildlife Department for the last five years. “Nobody understands the plight of farmers who have been pushed into a severe crisis. We have to protect our crops from monkeys, baboons, bears, porcupines, ‘amboos’ (multi-horned dear) and parrots during the day. At night, the crops are damaged by bats,” said Laxman Thakur, chairman, Ecohorts, Nandpur, Shimla district. Earlier bats used to feed on fruit in the Bajaura, Mohal and Bhuntar belts, but now they were invading orchards as far as Naggar and Manali, said Nakul Khullar, an orchardist at Ghurdor, Naggar. “We have erected high mast-lights in orchards and kept watchmen to keep bats at bay, but with a little success,” rued Balbir Chajta, an orchardist at Nandpur in Shimla district. “They come from resting sites in the Kuish area and eucalyptus trees near Rohru in the Pabbar valley and Tiuni, travelling long distances at night to invade orchards. We have to remove the fruit from tree canopies before the fruit is ready,” farmers said. The Forest Department of Uttarakhand had removed trees near its Forest Rest House Colony at Tiuni, the main resting site in the Pabbar valley, as the bat menace had spread in the entire Yamuna valley. The Himachal Wildlife Department had not done anything about the bat resting sites in the Kuish jungle near Rohru and Shmashi and Bajaura in Kullu, the farmers claimed. Wildlife officials said bats travelled long distances and could not be tracked. “We can take check their resting sites, but need permission from the Forest Department to chop or loop branches of trees,” they added. The elections were held under the chairmanship of Jiya Lal and secretary Tula Ram wherein Ram Lal was chosen vice-president, Baldev Krishen general secretary and Lila Dutt Sharma organisation secretary. Ajit Singh, after assuming the charge, said the union would continue to work for the welfare of employees and he urged them to help reduce the non-performing assets (NPA) and enhance deposits.